Hey guys! I recently ran out of my ultimate favorite BB Cream, Tony Moly's Luminous Goddess Aura BB Cream and since I haven't found another brand that's as good, I decided to repurchase my 3rd bottle. I was suppose to get the full size but when I saw this limited edition Luminous Aura BB & CC Special Set, I just couldn't let it go away and purchased it instead. Both products are housed in a pretty cylindrical tube with a twist off cap. At the back you will see the date when the products were manufactured and these were made in June 2013. The set contains a 30 ml bottle of Luminous Goddess Aura BB Cream which looks very compact compared to the full size that comes in a bulky 45 ml bottle. I love that it's small enough to fit in your kikay kit or bring with you to travel. Speaking of which, I will definitely travel with this tube on my next trip. The Luminous Pure Aura CC Cream in the set also contains 30 ml of the product while the full size comes in a 50 ml bottle with a pump. 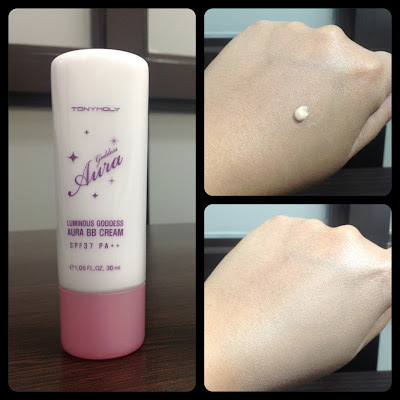 The Tony Moly Luminous Goddess Aura BB Cream has a nice soft texture which spreads effortlessly on your skin. 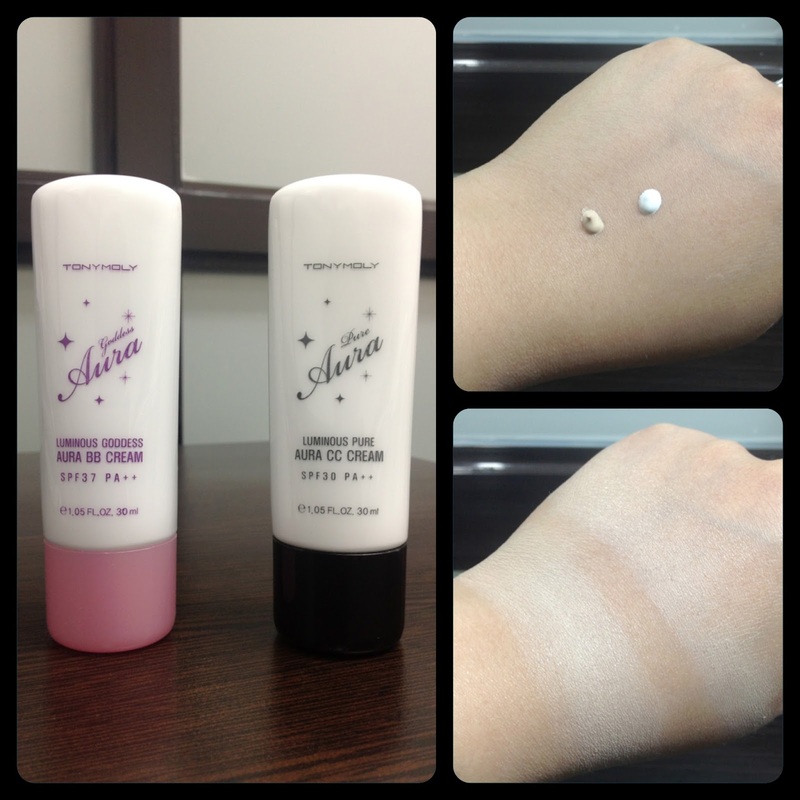 It doesn't leave a grey or ghostly cast, instead it gives a luminous effect which makes your skin glow. It may appear a shade lighter than your skin tone but it eventually adapts to your complexion giving you a natural dewy finish. It offers medium coverage over skin imperfections but the formula is so buildable that a fuller coverage can be achieved. Layering this might be a little risky because you might end up looking really white, so use it sparingly and just add a bit of concealer for darker blemishes. You may get a little oily on your T-zone in the middle of the day but nothing that an oil blotter or finishing powder can't control. It stays on the entire day without caking and it's gentle enough to use everyday without irritating your skin. 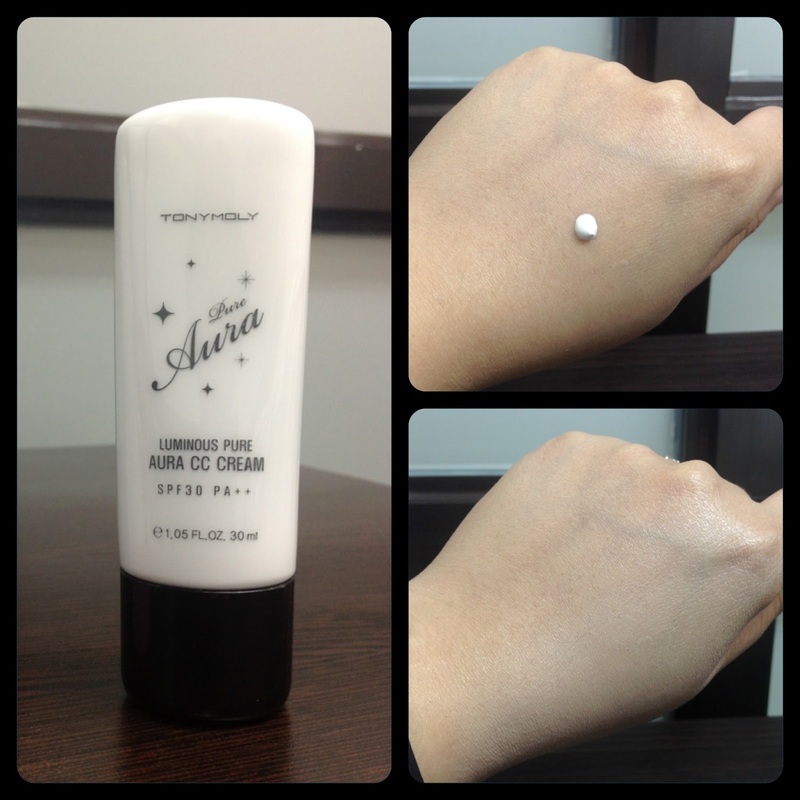 The Tony Moly Luminous Pure Aura CC Cream initially looks creamy white then transforms into a natural shade once you spread it on your skin. It doesn't leave a white cast but only offers light coverage over skin imperfections. It brightens up your face and has a dewy finish which may look a little greasy over time. Staying power isn't too impressive when used alone but stays longer and looks more natural when paired with a BB Cream. Both products look good on my skin but the BB Cream looks better on its own. It also spreads more easily and looks more natural than the CC Cream. Staying power is also longer with better oil control in the middle of the day. The BB Cream is also more affordable at 748 Php compared to the CC Cream which retails for 948 Php. If you're still torn between getting a BB or CC Cream, why not get both? I highly suggest you get this set to try both of them at the same time for just 948 Php. This limited edition set is available at all Tony Moly branches nationwide. Thanks for reading and have great week ahead! How much po yan Tony Moly Luminous Goddess Aura BB Cream? and where can I buy that? Thanks! Hi Agnes! The Tony Moly Luminous Goddess Aura BB Cream in full size retails for 748 Php and you can get them in Tony Moly branches like Eastwood, SM Megamall, SM North Edsa, SM Manila, SM Fairview, Alabang Town Center and Market Market. hẹp - bao quy đầu ngẹt - һoặc viêm bao quy đầu. My partner and I absolutely love your blog and find most of your post's to be what precisely I'm looking for. Do you offer guest writers to write content for you? I wouldn't mind creating a post or elaborating on a few of the subjects you write in relation to here. lot. I was looking for this certain information for a very lengthy time.